Two weeks ago, in my review of Jupiter’s new album, yours truly said he’d be surprised if someone released another Power Metal that good this year. Well, it’s still only January and we’ve already gotten two amazing records in the genre. Angra’s brand new ‘Secret Garden’ is just about as good. A fantastic record that probably represents the scope of the Brazilian quintet’s sound better than any of their other albums. It’s always suspenseful to see what a band comes up with after a lengthy hiatus, but in case of Angra, we shouldn’t have worried. ‘Secret Garden’ is stellar. Since 2010’s decent ‘Aqua’ album, there have been two significant changes in the Angra lineup. First of all, Fabio Lione is the band’s new lead singer. I have always thought that his predecessor Edu Falaschi was somewhat similar to him in terms of timbre and I think Lione delivers the work of a lifetime here. Also, returning original drummer Ricardo Confessori has been replaced by 24 year old Bruno Valverde, who seems to prefer a more natural drum sound, which is part of why ‘Secret Garden’ is so much more powerful sonically than ‘Aqua’. The South American percussion lends the album an interesting rhythmical edge as well. It’s the core of bassist Felipe Andreoli and guitarists Rafael Bittencourt and Kiko Loureiro who seem to be in charge of quality control here. 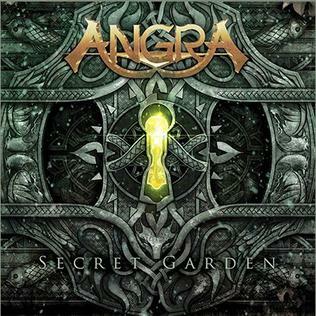 Despite two key members having been replaced, ‘Secret Garden’ still features Angra’s distinct progressive Power Metal sound. It does show the band exploring their extremes a little more; ‘Final Light’, the downtempo stomper ‘Violet Sky’ and opening track ‘Newborn Me’ (which has some amazing acoustic lead guitar work as well!) showcase the more progressive side of the band, whereas ‘Black Hearted Soul’ and ‘Perfect Symmetry’ are more traditional, upbeat Power Metal tracks. While Lione is credited as the album’s lead singer, Bittencourt also lays down some impressive singing. With his voice being lower and rawer than Lione’s, they are definitely complementary, as shown when they sing in unison in the amazingly atmospheric ‘Storm Of Emotions’. ‘Violet Sky’ and the uncharistically calm closing ballad ‘Silent Call’ even feature him as the sole singer. Two female singers make a guest appearance as well. Doro Pesch simply hasn’t sounded as good as on her almost Goth-like duet with Bittencourt (‘Crushing Room’) in years and I have yet to hear Epica’s Simone Simons sing something better than the album’s title ballad. Fans of Power Metal should buy ‘Secret Garden’ immediately if they haven’t yet. Make sure to get the limited edition, as it features a cover of one of my favorite bands (The Police) in the shape of ‘Synchronicity II’, another fine Lione-Bittencourt duet. Angra has yet to truly disappoint me, but ‘Secret Garden’ ranks right up there with ‘Rebirth’ and ‘Aurora Consurgens’ as my favorite Angra albums. A very interesting and strong comeback from one of the world’s best Power Metal bands. And I’ll rephrase my view: if the first half of January is in any way indicative of 2015, it will be an amazing Power Metal year.